The camp was on alert, the warriors standing at attention with weapons drawn. 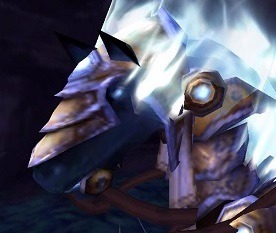 They watched as Alynore rode up on Tenacity, the charger’s wings of Light flaring and keeping them away. The other Dragoons waited a few yards behind. More Dragoons and Meddlers waited in the hills for the Commander’s signal. Nore dismounted, Tenacity pawing the ground. She glanced up as the shadow of a large bird passed overhead. She stood in her heavy armor, wearing her weapons, straightening her tabard, and waiting on Og’roc to step forward. He had agreed to the ritual of exchange, trading Jormund for a much higher priority prisoner—the Commander of the Silver Dragoons. There was ceremony here for the orcs, almost sacred in how it was meant to play out. I promise I'll be back in time, Anny. Don't worry! Her fingers wouldn’t curl around the handle of the mug. Her hand jerked as she tried to compensate, and the cup tipped over. The smaller, lighter troop models swept across the representation of Nagrand in a tide of coffee.